The Royal+ series is being expanded with the incorporation of five new designs. The main new characteristic of these sheet designs is the incorporation of particles which emulate precious metals such as Gold and Copper. These particles of various sizes are found in KRION® in the same way as we find metal in rocks, thus offering a majestic, inimitable aspect which can only be found in nature. 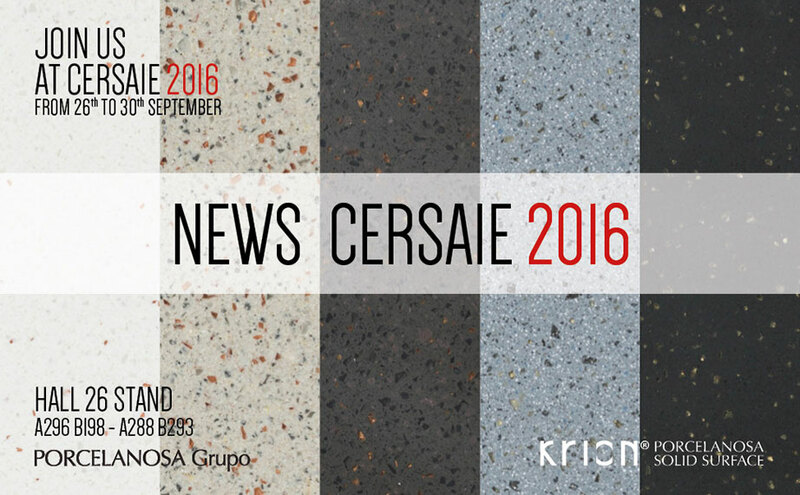 The surfaces of the new designs of the sheets of the ASTEROID series provide an unprecedented sensation in the world of the Solid Surface. This sensation is given by the extraordinary appearance of particles which arise in clusters in apparent disorder on the surface of the sheet. Their colours are in tones similar to the base colour and also include the same micro particles as the base. The final result of this combination of effects confuses our perception of the different elements which make up the design of the surface; however, their combination provides a sensation of haze inspired by nebulas whose colours and tones are currently fashionable in interior design, thus being easily combined with other decorative materials and elements. Line of under-worktop kitchen sinks with great formal beauty. Their straight lines and reduced radius create a design with a minimalist effect and allow easy cleaning. Available in brushed stainless steel. The collection of stainless steel bases for combining with KRION® has four formats with which KRION® transformers will be able to adapt to the design of any kitchen and install sinks constructed with KRION® and a stainless steel base. In this way it is possible to use any colour* of the KRION® series, including colours with particles, to make a sink which matches the kitchen with the basic tools of a transformer, without needing to use thermoforming techniques. These items are the definitive tool for using KRION® colours in the kitchen to its full extent. The 3-WAY and UNIQUE series of washbasins reappear with a covering with a metallic appearance to give even greater versatility in the planning of bathrooms. Copper, gold and titanium are the finishes available for the mounted washbasins.